IBM LTO Ultrium Generation 5 media is designed to deliver exceptional capacity and reliability at a lower cost per GB than other types of storage medium. Cartridge capacity of up to 3 TB (at 2:1 compression) helps reduce the number of cartridges and the amount of equipment, space and labor associated with tape-based storage. In addition, it helps reduce the time associated with backup and restore operations by reducing the amount of cartridge handling, further lowering operational costs. Reduce manual intervention by IT staff for tape operations and cut the physical storage space needed for backup cartridges with up to 3 TB (with 2:1 compression) of capacity in a single cartridge. Leverage the fast sharing of cartridge-dependent data with tape drives to speeds up load and unload cycles. Use IBM LTO Ultrium 5 in products featuring LTO Gen 5 tape technology to provide value as your storage needs and infrastructure grow. 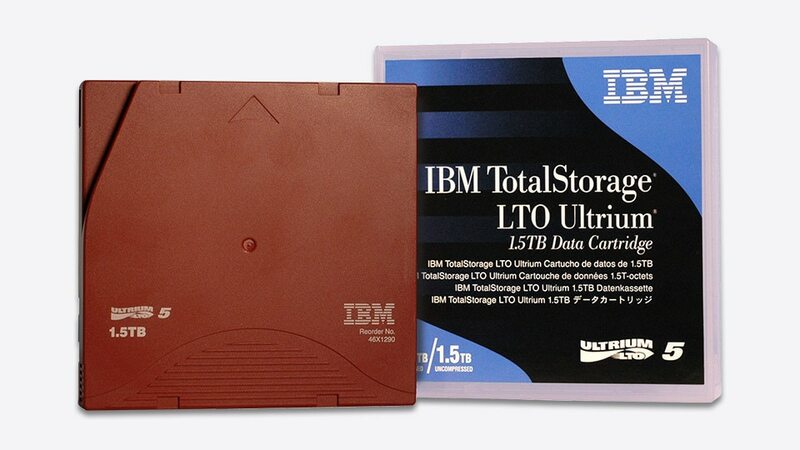 Designed to help improve read/write reliability by storing IBM’s statistical media read/write analysis on every use of the cartridge when used with IBM LTO tape drives.